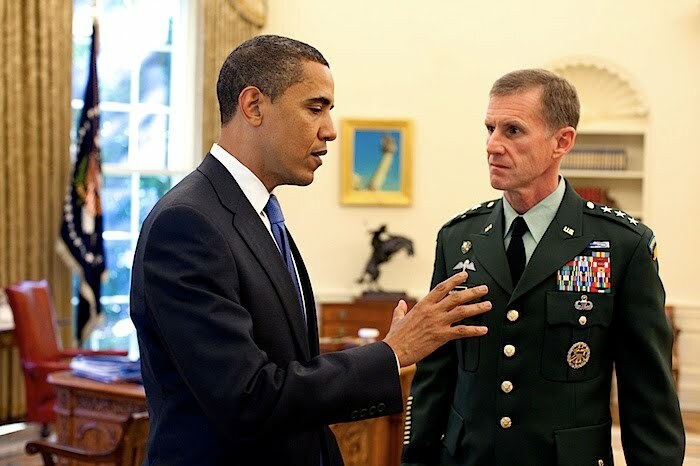 Af-Pak General Stanley McChrystal is in hot water after a Rolling Stone article was released today where he and his aids are quoted bashing President Obama, Vice President Joe Biden and others. It's ugly. Now, flipping through printout cards of his speech in Paris, McChrystal wonders aloud what Biden question he might get today, and how he should respond. "I never know what's going to pop out until I'm up there, that's the problem," he says. Then, unable to help themselves, he and his staff imagine the general dismissing the vice president with a good one-liner. "Are you asking about Vice President Biden?" McChrystal says with a laugh. "Who's that?" "Biden?" suggests a top adviser. "Did you say: Bite Me?" No, seriously I'm not kidding about that one. The trouble with appointing Stanley McChrystal to run the Af-Pak war was always his temperament and his history. He is a driven man, strong-headed, amazingly disciplined, extremely able in a limited fashion - and clearly unused to compromise or getting along with people as powerful as he is. Diplomat he is not. 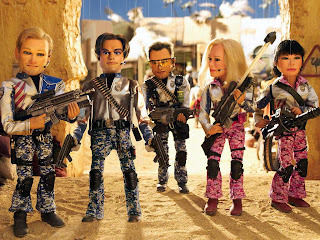 As head of JSOC, moreover, he has always regarded himself as above political management, running a part of the military that seems at times to answer to no-one, and that, under Bush and Cheney was unleashed to do whatever it wanted, including, of course, brutal torture in the field, condoned from the very top. These qualities might have seemed appealing at first for Afghanistan. Here you had a former torturer/badass who had learned by brutal experience that the wars in Iraq and Afghanistan cannot be won that way. Converted to counter-insurgency as a philosophy, he was an apostate from the Bush-Cheney approach of "kill, bomb and torture until they embrace human rights" school. It doesn't take a genius to see this contempt as rooted in the growing recognition among many and the growing fear among the McChrystal clique that Biden has been right all along, that the McChrystal strategy was a product of hope over experience, and that the arrogance that drove it was part of what had long been wrong with the conduct of both tragically flawed wars in Iraq and Afghanistan. It's a shock, isn't it? Obama essentially gave McChrystal everything he asked for, and backed the full counter-insurgency strategy. He has, in my view, foolishly thrown more resources and more ambition at this hopeless task than his predecessor ever did. And yet, McChrystal and his flunkies still feel the need to bad-mouth and mock those who lost the argument. This is news, no? It's important news. It reflects on the character and integrity of the man tasked to lead America's longest ever war. So why, one wonders, have we not heard a peep of this from all the official MSM Pentagon reporters and analysts with their deep sources and long experience? He saw the quotes before the story came out and had no objections?! Really?! Updated: McChrystal has submitted his resignation and it is up to President Obama to accept it when they meet tomorrow. Apparently, Keith Olbermann disagrees and thinks Obama should not accept McChrystal's resignation. Could The Republicans Really Impeach Obama? Dr. Rand Paul Is Not A Real Doctor?